It’s time to take your Deadly Strike to the streets and rock the Predator-look! We have already been given a solid colourway with the release of the adidas Deadly Strike Pack. Now adidas is going to spoil us one more time with the new Predator 18+ Boost sneaker. Are you ready to add the legendary Predator-look to your sneaker collection? We have finally reached the spring-season and to celebrate this adidas has given us a brand new colourway for the adidas Predator Tango 18+ Boost Limited Edition. Can you find a better way of celebrating the warmer and longer days, than wearing a pair of almost total blue sneakers, while also rocking your own Predator-look off the pitch? The Predator Tango 18+ Boost has the same royal blue colour as the Predator 18+ boots from the Deadly Strike pack, a stunning colour-combo suited for the warmer days. 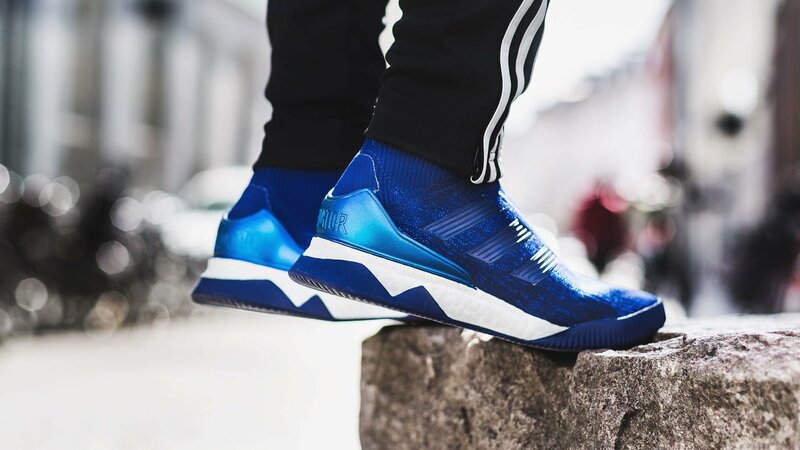 Even though the sneakers are plain blue with a white sole, adidas has used time on the details, giving the components of the sneaker different shades of blue. The base colour is slightly lighter, which also is seen on the Predator boots, while the heel is made in a darker blue and with a highlighted “Predator stamp” on it. The popular Boost sole is incorporated into the sneakers, which takes the comfort to new levels. Imaging walking down the street looking on point and feeling comfy at the same time. No better feeling for a sneakerhead I guess! But the Boost midsole offers a great shock absorption, so you can also dominate the game in the cage as well! It’s easy to see that adidas tried to incorporate the Deadly Strike design as much as possible into the sneaker. When putting on the sneakers or stretching the knitted area on the instep of the sneakers, you spot a slightly green colour. This is a colour which also is used on the adidas X 17+ Deadly Strike giving the sneaker a complete design. Get ready for spring with your own pair of adidas Predator Tango 18+ Trainer Deadly Strike Limited Edition. Get your pair fast before it gets sold out!